At long last, it’s finally the launch of our Chicago Coffee Shop series! To say that a lot of planning has gone into this series, a lot of effort, a lot of time...is the understatement of the century. I had no idea when I first came up with this concept it would be such a huge commitment. It seemed so easy! I mean, how hard could visiting a few coffee shops each week be? Needless to say, I’ve learned a lot throughout this process but two very important qualities. 1) It’s ok to ask for help and 2) sometimes things take a lot longer than we expect them to and that’s ok too. So, what is the Chicago Coffee Shop Series? It sounds pretty basic, right? Wrong! We’ve done an epic amount of research identifying coffee shops throughout many neighborhoods in Chicago and sat in them for hours to learn their strengths and weaknesses. How good is their wi-fi? Is there enough seating? Is it loud, quiet, the perfect coffee-shop level of sound? 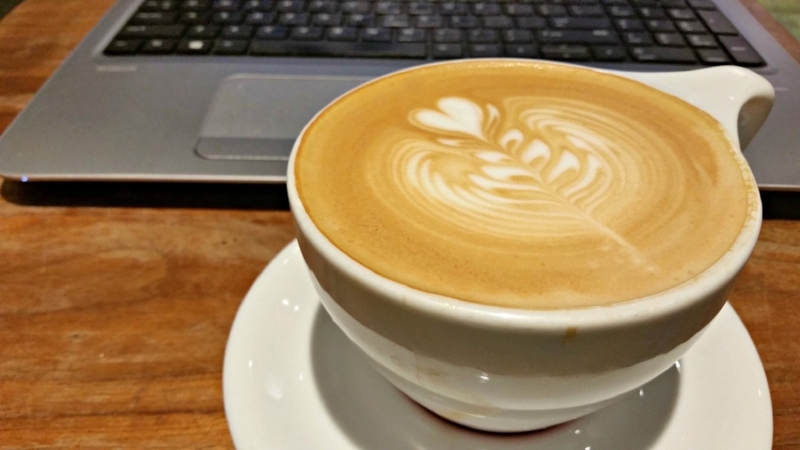 How are the baristas, friendly or standoffish? Is the coffee any good? Do they serve food? How late are they open? So many things factor into each coffee shop review so pardon us if these posts are a little longer than usual. We’ll break each down by location with a small summary of the experience and then list out the pros and cons. That way, the next time you’re looking for a new place to crank out the next great American novel, we’ve got the digs for you. Located in The Freehand hotel & hostel, Cafe Integral is a hip, bohemian coffee shop with personality and great pour over coffee. Their blends change often, especially for the pour over which comes in this nice, large carafe that you see pictured. It’s definitely worth the price if you’re planning to hang out for a while. The seating space is unique and comfortable. There are a variety of couches, sofas, chairs and tables to fit whatever mood you’re in. Come here to read, work, hangout or get out of the house. HERO Coffee Bar has fantastic food and coffee. They’re also in a prime location for Rock Island Metra train commuters as well as anyone from the LaSalle blue line ‘el’ stop or LaSalle & Van Buren brown, purple or green ‘el’ stops. They have free wi-fi but it’s spotty at best and slow. There is a very limited amount of seating space so to grab a spot, you’d be better off coming during non-peak hours. There weren’t a ton of outlets either so if you need to charge mid-work session, you could very well be out of luck. This is a great spot to meet a friend for a coffee and bite to eat or to grab coffee on the go. I wouldn’t recommend it for a work session though. Lavazza coffee is traditionally European. Rich, bold and so caffeinated that one espresso shot can power you for the day. There are several cafes throughout Chicago and each one offers something different. This particular location is within the Inn of Chicago making it a fantastic morning spot for tourists staying in the hotel. It’s also in a prime location off of Michigan Avenue for anyone needing a coffee or gelato break during their shopping. They have free wi-fi that works but can be slow. I didn’t see many outlets for plugging in and there is minimal seating. It’s great if you need a quick spot to send a few emails but I wouldn’t recommend unpacking here for a long work session. Located in the Virgin Hotel Chicago, Two Zero Three was an instant hit for me. It’s now my personal go-to when I have meetings or events in the Loop and need a place to work for a bit. Their coffee is delicious, especially their cappuccinos and lattes. I would suggest going out of your comfort zone and trying one of their specialty drinks. They also serve booze in case you’ve had “one of those days.” There’s a ton of seating from long communal tables to elevated window seats, couches and comfy chairs. There are outlets everywhere, even in the tables. The wi-fi can be a little difficult once in a while but more often than not, works fine for me. Otherwise, I wouldn’t be returning so often! Do you have a particular coffee shop you like to frequent “downtown” in Chicago? There are so many coffee shops throughout the city. Had we gone to every single one, it would have taken years to get this series moving. We picked these shops after a generous amount of research and narrowing the list down. Next up...the south side! If you have any recommendations aside from what you see in our series, comment below on any of our posts or give us a shout-out on social media. We'll add it to our list to check out and share our thoughts on social!